The Venetian leads the charge for another week outside of the Rio for large fields and mega prize pools. 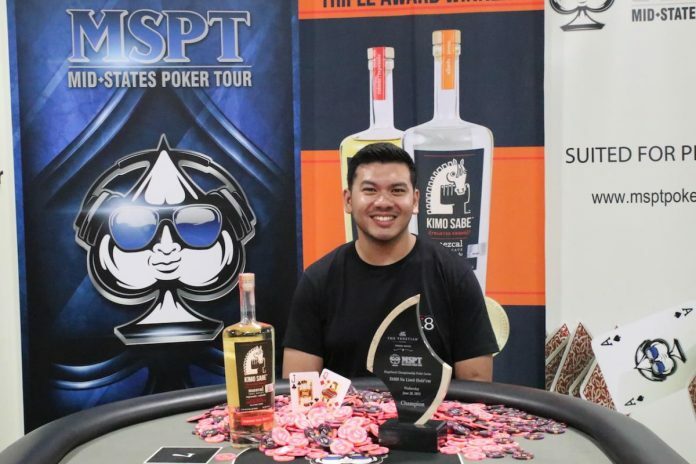 The latest recipient of a six-figure score in the DeepStack Championship Poker Series is Michael Soyza. The Malaysian defeated 2,877 entrants in the Mid-States Poker Tour $1,600 buy-in $3 million guarantee to collect $588,249. Soyza won a live-streamed final table in a Day 3 that lasted for 15 hours. 2018 WPT Fallsview Poker Classic runner-up Ryan Yu held the lead coming into Day 3 and bowed out in ninth place for $62,143. Another Season XVI runner-up reached the final table in Paul Fisher, who took fifth at WPT Choctaw. Fisher was the first player eliminated from the final table. A few others who had their hole cards shown on camera where WSOP Circuit ring winner Peter Vitantonio, past MSPT Main Event champ Rich Aslup, and eventual runner-up Jeremy Saderne. The $800 8-Max $800,000 guarantee hit an overlay snag and drew a crowd of 881. Arunas Sapitavicius emerged to win $133,609 in a heads up deal with Manuel Ruivo, who took home $130,391. MSPT hosts one more Main Event at The Venetian this summer. The $3,500 tournament carries a hefty guarantee of $3.5 million and finishes on June 30 at a live stream final table. The Wynn resumed their familiar schedule of one-day events and produced a few more quality winners. Antoine Saout added a second trophy to his summer collection for winning The $1,100 $200,000 guarantee on June 23 outright for $87,089. On June 2, Saout won the $600 $500,000 SuperStack at The Venetian to ship $137,504. Joining Saout in the Wynners Circle are Gerald Ringe, who earned $45,808 in the June 25 $500 $100,000 guarantee and Justin Brach. Ringe’s title compliments his 2015 bracelet for conquering the $1,500 Stud Hi-Lo tournament. Brach finished on top of Joe Kuether in the June 24 $1,100 $200,000 guarantee and cashed out for $92,079. The next multi-day event at the Wynn starts on June 26 with another $1,100 $1 million guarantee with three starting flights. When the Wynn put a seven-figure guarantee on the board two weeks ago, 2,427 entrants participated to set a record for the largest field at the property. The ‘Main Event’ of the ARIA Poker Classic kicked off this week with the multi-flight WPT500. The $1 million guarantee is expected to draw over 2,500 runners during the nine starting flights before Day 2 opens on July 2.